The late great, Mark Farren. GLENAVON boss, Gary Hamilton paid tribute to his close friend and Derry City legend, Mark Farren as the Lurgan Blues progressed in the Irish Cup on the second anniversary of his passing. The hugely popular Greencastle man, who remains Derry City's record goalscorer with 113 goals in 209 appearances, spent a season at Mourneview before he was forced to quit the game due to illness. His premature passing at the age of 33 in 2016 was mourned by football fans across Ireland and on Saturday Hamilton took time out of his side's post-match Irish Cup celebrations after a 3-0 win over Dungannon Swifts, to remember his close friend. 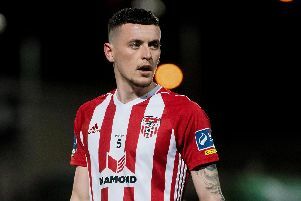 “We were exceptional and it’s a tribute it was on the second anniversary of Mark Farren’s passing,” said Hamilton, who signed Farren from Derry City in 2013. “I said to the boys before the game what Mark would give to have another game of football. “When he was in the bed and the brain tumour continued to grow, we knew the inevitable was going to happen. I remember him at the time and he couldn’t say too much, really just nodding his head or yes and no. But we all knew he was desperate to be able to play in one more game of football and it never happened for Mark. It was a sad time for us all at the football club and we still think a lot of the Farren family. Glenavon manager pictured standing in front of a tribute to the late Mark Farren at Mourneview.